Here you can view John's Pictures by category. Back to the Maison de Stuff. Pictures taken on one of my trips to (or while I was living in) Japan. Trip to Japan over Christmas and New Year. 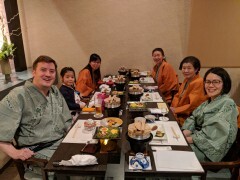 A couple of nights in Tokyo followed by the rest of the week in Hiroshima to see Chie and Erika at the end of their longer trip to Japan. Pictures from our trip to Japan in March 2016. Two weeks in Japan in November 2014. Erika's third trip to Japan. Erika's first trip to Japan, as she turned six months old, in March 2013. A week's business trip to Tokyo. Two weeks in Japan in late summer / early Autumn 2011. Two weeks in Japan over New Year 2009/2010. A week's business trip to Tokyo, and a great opportunity to meet up with lots of old friends. A two-and-a-bit week trip back to Japan, to meet up with old friends and revisit our old haunts. Pictures from our wedding, starting with a ceremony at Miyajima's Itsukushima Shrine, followed by a reception on a cruise ship, and then a final party in the centre of Hiroshima. Last month of living in Tokyo! More pictures from life in Japan, mostly in the latter half of November, including a short trip to the Izu Peninsula. The usual daily pictures from the month which marked one year of me working in Japan. A few days in Hiroshima. An afternoon touring Gifu followed by a night out in Nagoya. Another month of pictures from Tokyo, including a weekend visit from Leon, Gav and Stu. August - mostly work, work, work, and attempts to escape from Tokyo (both physically and mentally!). A weekend away in Nagano to escape Tokyo, and see our friend Junchan. More pictures from life in Tokyo, as the summer gets into full swing. 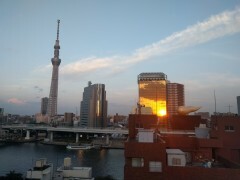 A month in Tokyo featuring a number of attempts at the weekend to get away from the place! Yet another monthly set of images from daily life in Tokyo. A few days spent in Hiroshima during a slew of national holidays that the Japanese call "Golden Week", in 2006. Pictures in Tokyo in April, complete with a good helping of the obligatory cherry blossom photos. Pictures taken in Tokyo in March 2006, during two and a half weeks between trips to Seattle and the UK. Includes a weekend spent with Lorenzo. Pictures in Tokyo in February 2006, including a visit to the Whisky Live exhibition, where I met such whisky celebrities as Richard Paterson and Dave Broom. Assorted pictures from daily life in Tokyo, at the start of the year of the dog. A weekend in Hiroshima, visiting Chie's family as a sort of late New Year's break. A New Year's Day outing to Kamakura, a town near Tokyo famous for its shrines and temples. More assorted pictures from life in Tokyo, taken in December 2005. A day out with Hide to go and visit Takaosan - a mountain conveniently located within short distance of Tokyo. Assorted pictures from daily life in Tokyo during the latter part of November 2005. A few pictures from a weekend out and about in the suburbs of Tokyo at the end of October 2005, including Sunday brunch with Lorenzo. Pictures from my second holiday in Japan in 2005 in July/August/September. Pictures from my first spell in Japan in May and June 2005. My third trip to Japan, encompassing Christmas and New Year. My second trip to Japan. A bit less sightseeing than last time but still plenty of nice pictures. My first trip! Two and a bit weeks exploring Japan. Hundreds of pictures to see!